We’re going Hollywood! ForgeFX Training Simulations is excited to be exhibiting at the Vision VR/AR Summit 2017, May 1 -2, in Hollywood California, sponsored by Unity Technologies. ForgeFX will be one of nearly 20 companies participating in the Vision VR/AR Summit Showcase, hosted in the summit’s premiere demo space, the showcase features innovators pioneering the best in virtual, augmented, and mixed realities from all around the world. Come try the VR Equipment Training Simulator, which we developed for JLG Industries, Inc., an Oshkosh Corporation company and a leading global manufacturer of aerial work platforms and telehandlers. The JLG VR Equipment Training Simulator combines stereoscopic real-time 3D, head, hand and positional tracking, multi-player support, and real-world control integration to deliver an extremely highly-interactive and immersive training simulator. 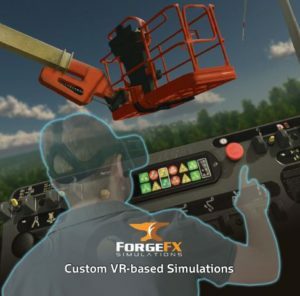 VR-based training simulators prepare operators for real-world operations, with far greater impact than traditional flat-screen simulators ever could. Virtual and Augmented Reality have captured the imaginations of millions around the world. If you are passionate about creating games, films, ads, art, journalism and more with these cutting-edge technologies, then join us at the Vision 2017 Virtual and Augmented Reality Summit. The Vision VR/AR Summit is an event for artists, engineers, programmers, designers, musicians, directors, producers, hardware manufacturers and researchers. The content and networking are focused on furthering the knowledge base of anyone developing virtual and/or augmented reality content in Unity. The Unity Vision Summit is a popular exhibition attended by market leaders in the VR, AR and gaming development world. This two-day event features demonstrations and discussions, that include enterprise, entertainment, art, and commercial uses of VR and AR technologies. 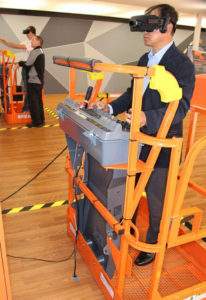 The summit will examine how industries can utilizing new VR and AR technologies to their advantage, just as JLG has done with their lift and access equipment VR training simulator. If you’re going to be attending the Vision VR/AR Summit next week, please be sure to stop by and give it a try!